It's easy to take the internet for granted. From entertainment to education to healthcare to business, there's no area of life that the internet doesn't touch, and as technology and consumer habits evolve, internet service providers deliver faster internet connections than ever before. But not everyone is privy to a high-speed connection in their home and ISPs are also actively working to ensure that every American family has access to high-speed internet connectivity. Through cable industry broadband adoption programs, more than 1.25 million low-income families are now connected to the internet. These initiatives reach families with school aged-children, as well as veterans and senior citizens and those receiving HUD housing assistance. Connecting families to affordable internet access is a priority for the cable industry. In fact, over $300 million have been invested in broadband adoption programs. ISPs like Comcast, Cox, Charter, Midco and Mediacom provide low-cost programs and resources for families in an effort to get as many people online as possible and to equip them with the training and tools necessary to make the most of the internet. Every year, more and more families join these programs. As connectivity and technology evolve, so must the effort to close the digital divide so that everyone can reap the benefits that the internet offers. 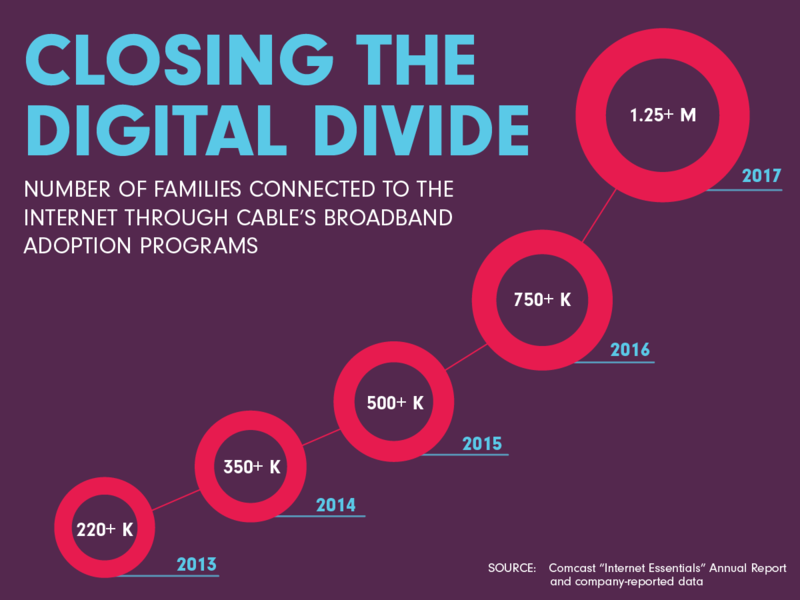 For more facts and figures on cable's broadband adoption programs, check out our page on Closing the Digital Divide.